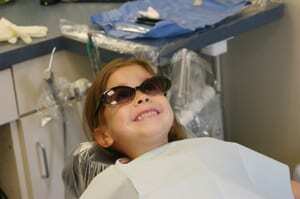 Your child’s first dental appointment is usually a fun, exciting time for them. Some parents worry that their child will have a bad experience, and so they try hard to prepare them. Those preparations almost always backfire. What parents end up doing is telegraphing their own anxieties about how the visit is going to go. The children pick up on this and become anxious themselves. Treat the visit as routine, no big deal, and your child will come in relaxed and ready for a fun time in our office. The worst thing you can do to your child’s attitude toward dental care is to wait until they have cavities or another problem before you bring them in. If their first visit is a simple routine check-up and maybe a gentle cleaning, that helps create the feeling that the dental office is a fun, friendly place to visit. What Can Your Child Expect at Their First Dental Visit? We strive to put your child at ease from beginning to end of their appointment. They’ll start off by meeting the hygienist, who will explain everything she’s doing throughout the entire process. She’ll gently clean your child’s teeth and even give them a crash course on how to correctly brush and floss. From there, they will briefly meet with Dr. Burba who will give them a quick check. For older children who have some of their permanent teeth, we’ll do a fluoride treatment. Throughout the appointment we’ll gauge your child’s comfort level, taking steps to put them at ease. As means of relaxing them, you are welcome to bring headphones so they can listen to music. We also have a television in the operatory where they can watch cartoons during their appointment. Once they’re done, they’ll be allowed to pick a prize from our treasure box as a reward. As a father himself, Dr. Burba understands how special your child is. If you’re ready to schedule your child’s first visit, you may call our office to schedule an appointment or click here to request an appointment online.